Did you win on our Facebook and also Twitter giveaway? Don't frown if you did not, as we will be running another giveaway on our Instagram! 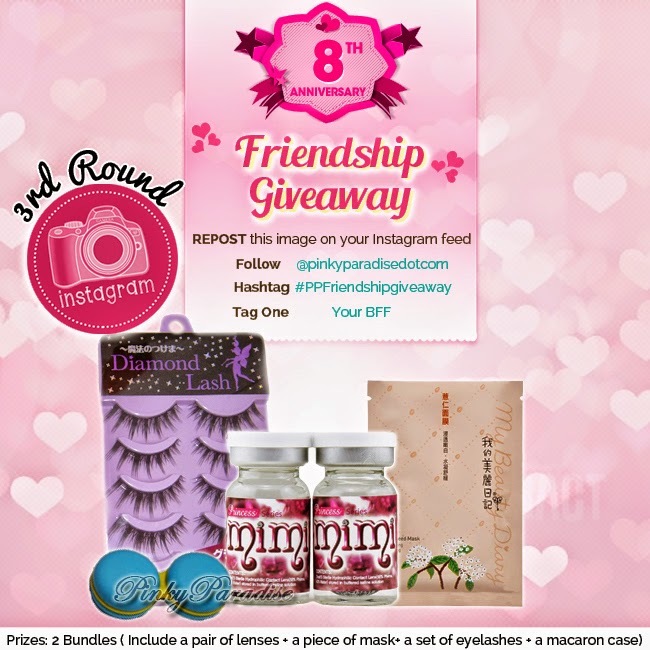 All you have to do is follow our instagram @pinkyparadisedotcom, screenshot the photo and repost it, tag your best friend there with the hashtag #PPFriendshipgiveaway and you will be in the run for the giveaway! 1 pair of lucky winner (winner and his/her friend) will win a bundle set each for themselves! So join now, repost, and ready to win the prize! Prizes: 2 bundles (Include one(1) pair of circle lenses, one(1) piece of face mask, one(1) set of Diamond Lash fake eyelashes and one(1) macaron case. *Instagram account must be available for public for us to see the hashtag. This giveaway will run until 3rd September 2014 (World Time).